INDUSTRY.co.id - Surabaya - The government officially launched an incentive to reduce the rate of tax on MSMEs in JX International Expo Surabaya, Friday (22/6). This incentive is regulated in accordance with the revision of Government Regulation (PP) Number 46 of 2013 on Income Tax on Income from Business Received or Obtained by Taxpayers with Specific Gross Distribution. Present at the launch were President Joko Widodo, Coordinating Minister for the Economy Darmin Nasution and President Director of Bank BRI Suprajarto. This incentive applies to MSMEs with turnover of less than Rp 4.8 billion per year in which PPh becomes 0.5% from 1%. Suprajarto who attended as one of the speakers at the launch said that as a bank focusing on financing UMKM, Bank BRI and HIMBARA also welcomed the incentive to reduce the tariff of SMEs. The decrease in tariffs will help SMEs to further expand their business and increase their investment because their tax burden becomes smaller. "This incentive is also expected to further drive the economy by strengthening formal business as well as expanding financial access", Suprajarto added. Bank BRI supports the process of depositing tax through the tax payment channel for the perpetrators of SMEs by providing more than 10,000 units of work as well as 330,000 Electronic Channel spread throughout Indonesia. In addition, the company will also socialize the policy and encourage SMEs to pay Final Income Tax on time. Until the first quarter of 2018, Bank BRI has distributed credit to the segment of MSMEs valued at Rp 584.7 trillion or 77.2 percent of the total loan portfolio of BRI. Loan disbursement to the segment of SMEs such as through the credit scheme of People's Business Credit (KUR). By the end of the first quarter of 2018, KUR BRI's distribution was recorded at Rp.22.3 trillion, or equivalent to 28.1 percent of KUR's distribution target broken by the Government to Bank BRI in 2018 at Rp.79.7 trillion. On the same occasion, Suprajarto revealed that Bank BRI will continue to distribute KUR according to the targets set by the Government but still adhere to the principle of prudence in the distribution. 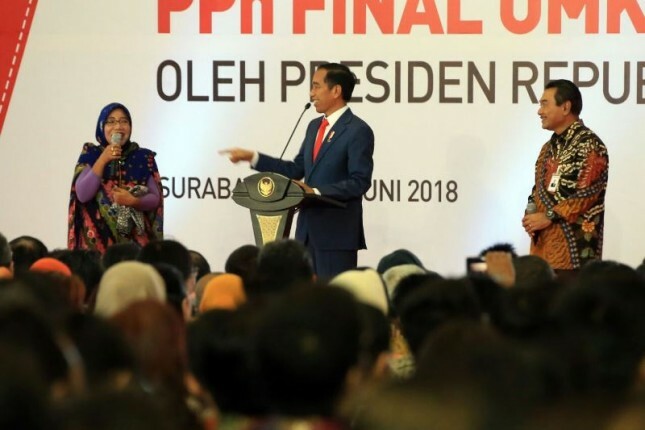 At the launch of the final Income Tax (PPh) of MSMEs to 0.5%, President Joko Widodo advised the UMKM actors to adapt to the industrial revolution 4.0. President said employers should immediately adjust and do not dependence to sell directly, but there is also online or online sales system that can also be utilized. Suprajarto also agreed on the statement. As a form of support to the empowerment of MSMEs in Indonesia in the era of industrial revolution 4.0, Bank BRI in early 2018 has launched Indonesia Mall, e-commerce platform to drive SMEs go-online. Excellent products from SMEs built by BRI can be directly accessed in e-commerce partners and can help SMEs to increase their product sales reach. Indonesia Mall itself can be accessed via http://bit.ly/IndonesiaMall. "Indonesia Mall is one of BRI Bank's strategies to encourage UMKM actors to go online, utilizing e-commerce to expand capacity and capability so as to encourage Indonesia to become the largest digital economy country in Southeast Asia," he concluded.